But history provides equally little assurance that gold will do well when bonds do poorly. In all months over the last four decades in which bonds fell, for example, gold fell as often as it rose — just as it did in the case of stocks. And the same was true for those months in which both stocks and gold fell. Gold fell as often as it rose for those months in which both stocks and gold fell? For example, Amazon commingles inventory from distributors at its fulfillment centers, so authentic products and fakes can get mixed together. Amazon better get a handle on the counterfeit problem. Commingling is definitely not the solution. I recently paid full price for two Playstation 3 controllers to replace ones that failed (due to excessive use as a gamer). I wanted to buy on Amazon for the convenience and the better price but did not trust the product they are selling. Although it averages 4 stars, take a look at the 13% who rated it 1 star (which I always read before making a purchase). There is a common theme. I've taken apart both this controller and a genuine Dualshock 3 controller, and the innards are vastly different as well. 98% of customers recommend this product. Best Buy won that round, at least for me, even at the higher price point. I was willing to drive somewhat out of my way to pick up in person. I've been using the controllers for a few days. No complaints so far. This is how it starts. Ask Chipotle. Once trust is lost, it can be very difficult to get it back. I can't speak for others, but my trust is clearly fading. Does Amazon's return policy solve the problem? Not exactly. First, it's annoying to have to return stuff. Second, Amazon may close your account if you return too much stuff. If the counterfeit problem continues to grow then things will certainly get interesting. This is not the first time I've written about counterfeiting, and it won't be the last. Still haunted by my experience as a research assistant in college. Riders are dependent on the quality of the underlying terrain and soft couches providing the insurance. If the couches fail, you may have to get in line with other riders at the hospital, says me, an anonymous blogger on the Internet. Just looking for an excuse to share the video. No worries. There are no serious injuries. One has to admire his persistence! Reminds me a bit of learning to snowboard in college. The falls were definitely when most of the learning took place. I was almost always riding that fine line between stability and instability, for I craved the speed more than I craved the stability. These days? Not so much. I prefer the stability over the speed, and you can see that in my investments. Since retiring, I have no desire to chase yield at the expense of safety. No desire to eek out a modest "safe" return by investing in riskier things and paying for insurance to make them less risky either. Perhaps the thought of paying for an insurance company CEO's private yacht turns me off? Perhaps I don't want to ever be in a position where the insurance company fails, I lose a lot of money, but the yacht never gets sold to pay me back? I am not getting more cynical as I age! Am not!! Well, maybe just a bit. If I am, it's for good reason though, I assure you. When something is called stable-value and yet the value is inherently unstable when stability is needed the most (during a financial crisis), my cynicism can only grow. 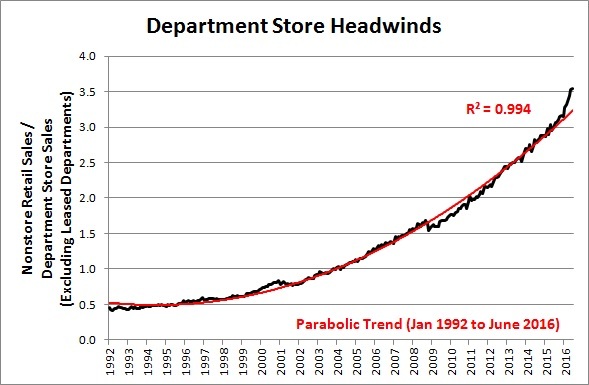 The following chart shows nonstore retail sales divided by department store sales (excluding leased departments). What's going to stop the long-term trend? If you look closely at the chart, the trend may actually be failing to the upside over the last 6 months. 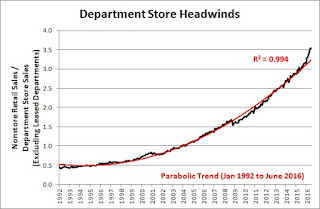 That means the department store headwinds are actually getting even worse than might have been expected. This could help explain why, as of today, the Amazon (AMZN) to Sears (SHLD) market cap ratio is a whopping 218 to 1 ($347.3 billion / $1.59 billion). Way to go Eddie Lampert! Fighting hurricanes, at nearly unspeakable odds, nearly single-handedly? You da man! NEW YORK (Fortune) -- Billionaire hedge fund manager Eddie Lampert, who controls Sears Holdings (Charts, Fortune 500), has earned a reputation as a boy wonder of retailing by wringing profits from an aging department store chain. Well, you know what they say. Nobody ever rings the bell wrings the profits at the bottom! Chuck, you are absolutely right. I'll try to find some meaning in my meager unsatisfying existence by playing with our dogs today, as I force back the tears, when deep down, all I really want to do, as an introvert and as a frugal saver, is invite total strangers into my home to install new granite countertops. It's the curse of my life. On the 14th, you reminded me that I'm saving too much to be truly satisfied in retirement. Today, you remind me that I didn't save enough to be comfortably retired in the first place. Dow 150,000? I'm not even close! When deciding among a Roth IRA, 401(k) or a traditional account, it depends if it makes more sense to pay income tax now or to wait and pay income tax after retirement. This is a complicated decision that has more to do with the specifics of a situation and whether one anticipates they will be in a higher tax bracket at retirement. "For anyone whose marginal tax rate is 25 percent or less, which is most of America, I think you go with a Roth. Better to take the hit up front, then allow your Roth IRA to compound tax free for the rest of your life," Cramer said. There's no math to support that simple decision, of course. The complicated decision was simply swept under the rug. You just have his word on it, and apparently it works for everyone in the 25% tax bracket or lower. Why is it better for a lower income worker to lock in the 25% tax rate? Beats me! I'm retired. When I was working, I was generally in the 28% tax bracket. Thanks to low inflation, low interest rates, and no job, I'm now solidly in the 15% tax bracket. Glad I didn't lock in 28%! And then there's this silly emotional inference that the Roth IRA is superior because it compounds tax free. If you prepay 25% in taxes or pay 25% when you withdraw, it's all the same. The difference between a traditional IRA and a Roth IRA can be seen in the following formulas with $1000, a 25% tax rate, 6% growth, and 30 years. There is no difference between taking it out in the beginning or taking it out at the end. None. There will be a difference if the tax rate changes though. That's why it is a complicated decision. One needs to know what will happen to the tax rate in order to decide which IRA to use. I'm in the camp which believes that the tax rate will likely be lower in retirement for most people, especially for poorer people, just like mine is. I no longer have a job that pays me a salary. Lower income, lower tax rate. That doesn't mean all my taxes are lower though. The government finds other ways to tax me. Sales tax rates only seem to go up. It's all the way up to 9.5% in King County, WA. Ouch. Property taxes are climbing substantially again too, because we all apparently love inflating the bejesus out of housing prices. The Roth IRA does not protect against either of those. And don't even get me started if the US someday adopts a value-added tax (VAT). Roth IRA investors could easily become the tax bagholders. Prepay the income taxes and then pay the consumption taxes later? Ouch. Could happen. The decision to invest in a Roth IRA is not a simple one, no matter what Cramer says. It just isn't. One thing is nearly certain though. If you are in retirement, and have prepaid the taxes on all your investments, then you probably won't be paying much in income tax. Without income to be taxed, how will you be in a high tax bracket? Just something to think about, not that Cramer thinks you should think. Simple decision. Right? I do not mean to imply that I have replaced Cramer's simple decision with a simple decision to do the opposite. For example, if inflation picks up and stays extremely elevated, my inflation-protected treasury investments, held outside my retirement account, would likely push me into a much higher tax bracket. So far, so good. Unfortunately, past performance is not necessarily indicative of future results. Sigh. This is definitely not simple investment advice. At best, it's complicated opinions on a complicated topic. Want some real advice? Your lifetime individual retirement account decisions are not a Mad Money lightning round! Take some time to think them through. "As one of the nation's leading retailers of mattresses, Sears is proud to surprise and delight new homeowners who are celebrating their first night at home by giving them a $500 Sears gift card for all the home essentials they need to get settled into their new place," said William Savage, SVP and President of Home, Seasonal Outdoor Living at Sears. Sears (SHLD) fell 2.4% today, after falling 5.4% yesterday. I don't think shareholders are really seeing the big picture here. $500 is money well spent! Granted, I won't be spending more money at Sears because of this campaign, at least not yet. Knowing others are winning $500 doesn't make me want to spend more. Is it just bitter envy and jealousy? No, that's not it. Not my style. I'm simply waiting to potentially win the $500 gift card for being a select existing homeowner someday. Call me a frugal optimist! Hahaha! Somebody will spend $500 though! I'd be willing to bet that Sears revenue will grow nearly $500 for every $500 gift card they give away! Why not the full $500? Well, somebody still shops at Sears. If that somebody gets a $500 gift card then they might just use it instead of their own money. That would put a dent in the expected revenue growth of giving away free money. That's the real genius of this campaign though. Since fewer people shop at Sears these days, the odds of giving a gift card to an existing customer have fallen. There's no way they would have tried this desperate revenue maneuver in my youth. Sears appliances, televisions, stereos, bicycles, tools, clothes, and toys (erector sets, binoculars, microscopes, and so on)? Our house was filled with stuff from the Sears Wish Book! These days? Not so much. There's one lonely Sears freezer in my garage now. Been there for more than a decade. That's it. Eddie Lampert, my existing home is an untapped source of future Sears revenue growth! For every $500 gift card you send me, I guarantee you the full $500 in revenue growth that you seek! That's right, every last penny. Give you my word! Not only that, but I'll be very quick about it. I wouldn't want to risk the closest Sears store closing before I got to it. You have a nasty habit of shuttering them! P.S. For those who have heard the deflation speech of Ben Bernanke, there is something more that can be said here. Sears has a technology, called a free $500 gift card printing press (or, today, its electronic equivalent), that allows it to produce as many free $500 gift cards as it wishes at essentially some cost approaching $500. If you are an existing shareholder, good luck on that. Disclosure: Neither long nor short. Just continuing to watch the Sears slow-motion train wreck from the sidelines (since 2007). Swift suggests that the impoverished Irish might ease their economic troubles by selling their children as food for rich gentlemen and ladies. This satirical hyperbole mocks heartless attitudes towards the poor, as well as British policy toward the Irish in general. Although child-care costs are soaring since 2009, tuition and fees at 4-year public schools are up 71% in the last decade, and real median household income has generally been falling since 1999, that sort of satirical "modest proposal" hyperbole could never happen in America! Facebook: "Boneless Skinless Children's Thighs"
The bears are about to bulldoze the homebuilders — according to one trader. Trader's name? Unknown. Trader's real reason for making the trade? Unknown. Could be a bear. Could be a bull buying insurance against a decline. Could be part of a bet on increased volatility. The only person who knows for sure is the anonymous trader. $675,000 is nearly $700,000, not $7 million. The ETF is already down more than 11 percent from its 2016 high hit June 9. According to Yahoo Finance, the high on June 9 hit $34.66. XHB has been above that price all day. Where's the 11% loss? According to Yahoo Finance, the previous high for 2016 was actually $35.03 on June 8, not June 9. Strike four. You're still out. But hey, The Seven Million Dollar Man's bet sure was excellent clickbait. Right? And isn't that all that really matters? Certainly enticed me to post something on my blog! 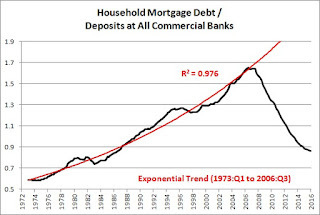 The following chart shows mortgage debt of households and nonprofit organizations divided by deposits at all commercial banks. 1. Wizard of Wharton. Jeremy Siegel warned savers to not lock in long-term interest rates five years ago. Other than a massively growing deposit glut and plummeting interest rates since then, it was sound advice! 2. Wizard of Sarcasmia. If you send him $100, then he is legally obligated, under current galactic law, to send you one bag of authentic Spanish doubloons weighing no less than 87 troy ounces. Get you some! 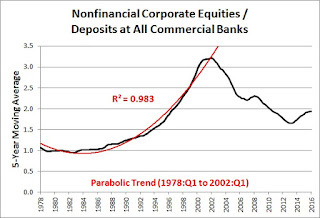 The following chart shows the 5-year moving average of nonfinancial corporate business equities divided by deposits at all commercial banks. Put a fork in that unsustainable trend. It's done. In honor of the 4th of July, I tried to find a chart that everyone in this deeply polarized country could finally agree on. So, here it is. No matter which side of the political and/or economic fence you find yourself on, the 1980s and 1990s are over! Hurray! The parabolic dotcom bubble is the monetary gift that just keeps on giving. Isn't that awesome? Who knows what will happen next. 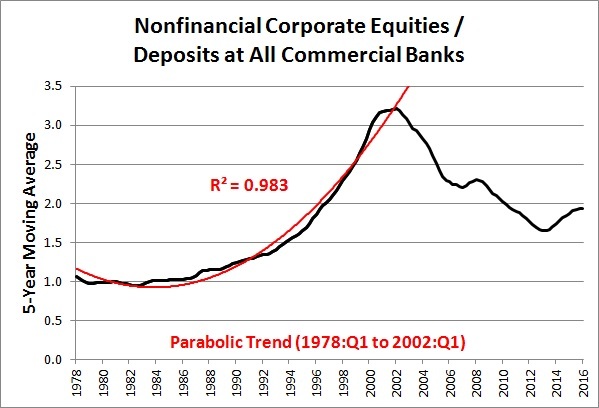 No matter what happens, deposits almost always grow. That we know. Further, thanks to big depositors depositing big money and earning small money in a low real growth environment, it's never been easier for small depositors to make even smaller money depositing small money. Dizzying. Stocks sometimes grow too. Just depends on how much this country's many heavily indebted companies are willing to bid for this country's many heavily indebted companies. Stock buybacks, mergers, and/or acquisitions don't always come cheap. Few seem to want to talk about subprime corporate borrowers. 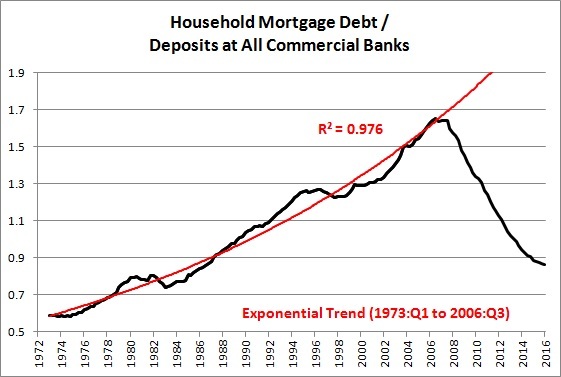 Perhaps all future subprime pain has been permanently contained, much like it almost was heading into the housing crisis? Oops. I didn't mean to say subprime corporate borrowers. My bad. I meant to say heavily leveraged companies. Oh, that sounds much better! Who doesn't love leverage? This will probably be my last post for a while. Taking a break. Have no fear. I'll probably start right back up when something related to this economy breaks again and/or continues to break.